Diagnostic ultrasound is an imaging modality that is useful in a wide range of clinical applications, particularly prenatal diagnosis. There is, to date, no evidence that diagnostic ultrasound has produced any harm to humans (including the developing fetus). Diagnostic ultrasound is generally perceived by users and patients as a safe technique with no adverse effects. Since ultrasound is so widely used in pregnancy, it is essential for all practitioners to ensure that its use remains safe. Ultrasound causes thermal and mechanical effects in tissue which are increased, as the output power is increased. Most other types of examination are of less concern than are obstetric scans. Specific guidance on a range of non-obstetric examinations (including gynecological, neonatal, ophthalmic, general abdominal, cardiac etc.) can be found in many other sources. In the last decade, there has been a general trend towards increased output, with the introduction of color-flow imaging, more use of pulsed ‘spectral Doppler’ and higher demands on B-mode imaging. In response to these increases, recommendations for the safe use of ultrasound have been issued by several bodies. In addition, recent regulations have changed the emphasis of responsibility so that more of the obligation is now placed on the operator to ensure that diagnostic ultrasound is used safely. Despite its apparent excellent safety record, ultrasound imaging involves the deposition of energy in the body, and should only be used for medical diagnosis, with the equipment only being used by people who are fully trained in its safe and proper operation. 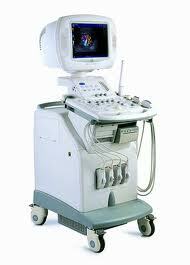 It is the ultrasound scan operator who is responsible for controlling the output of the ultrasound equipment. This requires a good knowledge of scanner settings, and an understanding of their effect on potential thermal and mechanical bio-effects. A fundamental approach to the safe use of diagnostic ultrasound is to use the lowest output power and the shortest scan time consistent with acquiring the required diagnostic information. This is the ALARA principle (as low as reasonably achievable). It is acknowledged, that in some situations it is reasonable to use higher output or longer examination times than in others: for example, the risks of missing a fetal anomaly must be weighed against the risk of harm from potential bio effects. Consequently, it is essential for operators of ultrasound scanners to be properly trained and fully informed when making decisions of this nature. Ultrasound is a mechanical energy in which a pressure wave travels through tissue. Reflection and scattering back to the transducer are used to form the image. Thermal effects-heating of tissue as ultrasound is absorbed by tissue. Heat is produced at the transducer surface. Cavitation- the formation of gas bubbles at high negative pressure. Other mechanical effects- radiation forces leading to streaming in fluids and stress at tissue interfaces. The implications of these effects have been determined by in vitro, animal and human epidemiological studies and are briefly summarized below. The thermal index (TI) and mechanical index (MI) is introduced to provide the operator with an indication of the potential for ultrasound induced bio-effects. TI provides an indication of the relative potential for a tissue temperature rise. MI provides an indication of the relative potential for ultrasound to induce an adverse bio effect by a non-thermal mechanism such as cavitation. Any potential bio-effects are likely to be of greatest significance in the embryo or fetus. Thus when undertaking obstetric scans restriction to scanning times are recommended these have been formulated on the basis of thermal effects arising from the scan and are therefore based on the thermal index (TI). Obtain diagnostically satisfactory images. Regulations governing the output of diagnostic ultrasound have been largely set by the USA’s Food and Drug Administration (FDA), although the International Electrotechnical Commission (IEC) is currently in the process of setting internationally agreed-upon standards. According to the current FDA regulations, the maximum levels for spatial peak time averaged intensity is limited to 720 Mw/cm2. The thermal index is the ratio of the required power used to cause a maximum temperature increase of 1C. A thermal index of 1.0 indicates a power causing a temperature increase of 1C. A thermal index of 2.0 would be twice that power but would not necessarily indicate a peak temperature rise of 2C. The temperature rise is dependent on tissue type and is particularly dependent on the presence of bone. The mechanical index is an estimate of the maximum amplitude of the pressure pulse in tissue. It gives an indication as to the relative risk of mechanical effects (Streaming and cavitation). The FDA regulations allow a mechanical index of up to 1.9 to be used for all applications except ophthalmic (maximum 0.23). All current regulations place considerably more responsibility on the user to understand the meaning of the output energy and to apply the lowest usable energy.